Give your core level students the support and framework they require to get their best grades with this book dedicated to the core level content of the revised syllabus and written specifically to ensure a more appropriate pace. 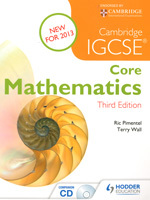 This title has been written for Core content of the revised Cambridge IGCSE Mathematics (0580) syllabus for first teaching from 2013. We are working with Cambridge International Examinations to gain endorsement for this title.